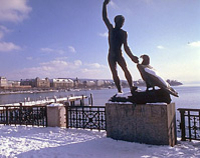 Travel from Zurich Airport to your Zurich Hotel. Transfer services are available 24 hours a day, 7 days a week. This is a private transfer service so the price is the same for groups of 1-3 people who will be transferred in a private car (Mercedes S-Class) and the same price will apply for groups of 4-8 people who will be transferred in a private car or minivan (Mercedes Viano or Sprinter). When making a booking, you will need to advise your flight details and your Zurich Hotel details. Your transfer will be confirmed instantaneously and you will be provided with a travel voucher to present to the driver.